WASHINGTON — For Les Ralston, 1991 was a dark time. The AIDS crisis had ravaged the gay community, and many of his friends were dead or dying. No effective treatment had been found for HIV, and many people were afraid to go near those with the disease. “A lot of people were dying at home without any food,” Ralston recalled. 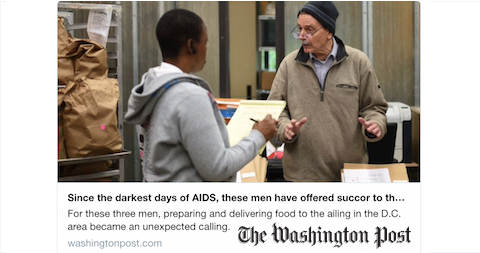 So when he saw a note on a billboard seeking volunteers to help a D.C. organization, Food & Friends, deliver meals to people with AIDS, Ralston, a systems analyst for the IRS, signed on. By 1995, he had quit his government job and was working full-time for the organization. He never left. At 68, Ralston is one of several people, including its executive director, who began working there at the height of the HIV/AIDS crisis and cannot imagine leaving. Now in their 50s, 60s and older, they saw the organization evolve from one with 100 clients to one that now feeds more than 2,800 mostly low-income residents of the Washington metropolitan area each year.